After experimenting for nearly a decade in two (cold) blast furnaces built in Mauch Chunk, LC&N Co.'s White and Hazard went recruiting in Wales after news reached them Anthracite pig iron was regularly and reliably being produced in George Crane's Yniscedwyn Iron Works, by David Thomas. Catasauqua Creek, about 6 miles below the Lehigh Gap and 14–15 miles (23–24 km) from the company offices in Mauch Chunk, was chosen for a new joint venture by LC&N and David Thomas, the Lehigh Crane Iron Works. After building infrastructure, including a firebrick works, a second blast furnace was under construction when on July 4th, 1840 the first hot blast furnace in North America produced Anthracite pig iron, a necessary precursor (feed stock) to producing wrought iron and cast iron. In that moment, the world changed. Note the lack of any modern road network—lacking automobiles, motoring clubs connecting towns to one another were not yet formed so political forces hadn't yet begun turning county tracks and dirt & gravel toll roads into paved roads. Anthracite iron or Anthracite 'Pig Iron' is the substance created by the smelting together of anthracite coal and iron ore, that is using Anthracite coal instead of charcoal to smelt iron ores — and was an important historic advance in the late-1830s enabling great acceleration the industrial revolution in Europe and North America. Unlike many seminal advances, the contributors, place and date of this epoch are well recorded within specific moments in the late 1830s. The first repeatable and reliably successful furnaces and smelts were managed by the same person in both the United Kingdom and the United States, in the principal control and supervision of Ironmaster David Thomas who had begun experimenting with attempts to use locally available Wales anthracite deposits as early as 1820 soon after he became in charge at Yniscedewin Iron Works in Wales. About this 1837-38 timeframe experiments were also being made in Pennsylvania near Port Carbon, and in Mauch Chunk, but with overall better success than in Wales. White, Hazard and the LC&N Co. had begun systematic experiments to smelt using anthracite in two furnaces in Mauch Chunk in 1832-1837 with intermittent but sporadically improved successes using cold blast processes with two differently designed furnaces. While this preliminary work was being done on both sides of the Atlantic, another brain [in Scotland] was at work, which furnished the key that unlocked the secret to success, by Mr. Neilson of Glasgow, the inventor of the hot-blast, who in 1828 obtained a patent for his valuable invention, the importance of which was not realized for a long time. The pamphlet on the hot-blast, issued by Neilson, was eagerly read by Mr. Thomas, who was at once convinced of the value of the discovery. One evening, while sitting with Mr. Crane in his library, talking the matter over, he took the bellows and began to blow the anthracite fire in the grate. "You had better not, David," said Mr. Crane; "you will blow it out." And Thomas replied, "If we only had Neilson's hot-blast here, the anthracite would burn like pine." Mr. Crane said, "David, that is the idea precisely," and this idea both recognized as one which would bear working out; and through Mr. Thomas's indomitable pluck and perseverance it succeeded. In fact, this was the origin of the successful application of the hot-blast in making iron with anthracite. In the meantime the Clyde iron-works, in Scotland, had put a furnace in operation, using the hot-blast with semi-bituminous coal in the furnace. Mr. Thomas urged upon Mr. Crane the immediate adoption of the new discovery, and he was sent to Scotland to see how the process worked. After the most careful examination, Mr. Thomas determined that the hot-blast was just what was wanted for an anthracite furnace. He returned to Yniscedwin with a license from Mr. Neilson, and an expert mechanic who understood the construction of heating ovens, and at once proceeded to construct hot-blast ovens, and erected them at the furnace which was known as the 'Cupola furnace,' 11 feet bosh by 45 feet high. The furnace was blown in, February 5, 1837; the success was complete; and anthracite-iron continued to be profitably made from said furnace without intermission [thereafter]. Anthracite-iron was a new-born commodity in the commerce of the world, and David Thomas was its godfather. The news of his success spread over the United Kingdom; the London Mining Journal gave it great prominence ; and an account of the discovery appeared in the press of the United States. The first American smelt of Anthracite Pig Iron was performed July 4, 1840 by principal-partners David Thomas, Josiah White and Erskine Hazard at their Lehigh Crane Iron Works in their first hot blast furnace along Catasauqua Creek aided by Samuel Thomas and the employees of the LCIW, in what became Catasauqua in Northampton County, Pennsylvania. The technology enabled industries the chance to produce cast iron sufficient to demand and eventually adapt production to also feed the demand to generate wrought iron and steel. These useful materials are achieved by adding additional processing — by taking pig iron as an ingredient into a reverberatory furnace (and in later years, a Bessemer converter). Anthracite, also known as stone coal or rock coal, is very difficult to ignite, mine, clean, and break into smaller chunks and requires correct conditions to build heat or hold temperature and sustain burning—which oft depend upon the size and uniformity of the coal particles. Yet American cities were cramped for fuels, woodlands were exhausted near bigger towns and Philadelphia, largest city in America needed fuels for mills and foundries as well to sustain manufacturing. Inventor and industrialist Josiah White (owner of a wire mill, foundry and nail factory), had determined how to burn anthracite in iron working processing furnaces during the War of 1812, but its use in smelting operations was hit or miss, dependent upon the material packing geometries of any particular charging load in a cold blast furnace. 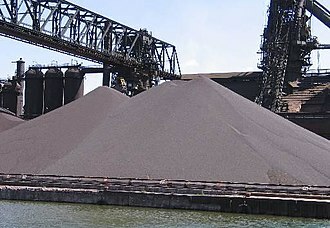 The earlier development of coking of bituminous coal, as well anthracite coke enabled the smelting of iron using local coal sources with cold blast air in blast furnaces after the latter 1830s allowed the production of the vast quantities of iron that built the fundamental infrastructure of the early North American Industrial Revolution — which was built on iron products and only some steel. At the time, iron was used minimally with respect to wood. Even most railroad tracks were laid with wooden rails, sometimes covered by iron strapping. As more iron became available, more uses were found for iron, creating a cycle of increasing demand, experimentation and improvements— part of the revolution in industrial revolution. During the United States' first energy crisis stands of forest near larger towns and America's Eastern Seaboard cities became farther and farther from population and factory centers, raising the price of fuel for heating and smithies, especially clean burning charcoal — long the fuel of preference for smelting and glass making, creating a decades long search for alternative fuels. By mid-1792 prominent Philadelphians had formed the Lehigh Coal Mine Company (LHCM Co.) to bring Anthracite to cities reachable via the Delaware River Valley, especially Philadelphia — the nation's largest and most industrialized city, though no one fully understood how to use anthracite as a sole fuel—just that it 'could' burn 'some' of the time with a hot enough base fire, so could augment furnace fuels. The LHCM Co. had great difficulty getting many ark-loads of coal to the docks in Philadelphia, much less having capabilities to make reliable deliveries of the fuel to industries risking its use, for the 46–47 miles (74–76 km) trip from Lausanne along the Lehigh River's variable water height and many rocks and rapids then surviving the over 70 miles (110 km) on the equally untamed Delaware River. In the midst of the War of 1812 iron industry magnate Josiah White set his foremen to systematically conducting experiments as how 'stone coal' could be made to burn reliably. It was recognized as some use aiding other fuels, and pack animal loads occasionally reached the city, which had mills and foundries desperately needing to circumvent the British Naval Blockade, so Bituminous Coal coastal shipments up from Virginia might resume. These experiments established a bottom draught and closed doors (reflection or reverberatory furnace techniques) were the key. Before the war, Baltimore, New York, Newark, New Haven, Boston, and Philadelphia industrialists were importing Bituminous via shipload from Virginia and Great Britain, and these supplies became difficult to obtain or blocked politically by the war and its preceding embargoes on British goods. After the war, the sanctions continued until various boundary disputes were resolved as far away as The Oregon Country and the Columbia River basin. Meanwhile, between 1814-1818 industries along the Eastern Seaboard were still thirsting for energy relief when inquiries to the LHCM Co. by Hazard & White indicated the operation & rights of the company were available. Frustrated by the snail-like progress of improvements that would become the Schuylkill Canal, White & Hazard applied to the Pennsylvania legislature for the rights to improve and operate navigations upon the rapids-strewn Lehigh River initiating the process that lead to the Lehigh Canal—beginning regular high volume & reliable coal deliveries in late 1820 — and the great changes a flood of anthracite would create in the next century. Research into the smelting of iron using anthracite coal (without coking it first) began in the 1820s in Wales by Thomas, experiments in France, most notably by Gueymard and Robin at Vizille in 1827, and in the 1830s in Pottsville & Mauch Chunk, Pennsylvania. 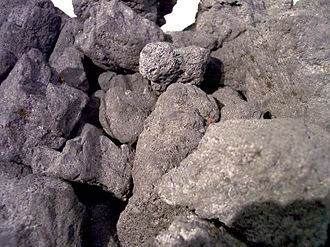 Early attempts tried to gradually substitute anthracite for other fuels, such as coke or charcoal, but all failed due to the use of cold blast techniques, which generated insufficient heat to keep the anthracite in regenerative combustion. In the same time-frame, Thomas had also continued experimenting with mixes of Anthracite and other fuels, before he combined those experiments and the new hot blast processing. Mr. Thomas determined that the hot-blast was just what was wanted for an anthracite furnace. He returned to Yniscedwin with a license from Mr. Neilson, and an expert mechanic who understood the construction of beating ovens, and at once proceeded to construct hot-blast ovens, and erected them at the furnace which was known as the 'Cupola furnace,' 11 feet bosh by 45 feet high. The furnace was blown in, February 5, 1837; the success was complete, and anthracite-iron continued to be profitably made from said furnace without intermission. Anthracite-iron was a new-born commodity in the commerce of the world, and David Thomas was its godfather. The news of his success spread over the United Kingdom; the London Mining Journal gave it great prominence, and an account of the discovery appeared in the press of the United States. In May 1837, Solomon W. Roberts of Philadelphia came to Yniscedwin, saw the furnace in operation, and at once reported to his uncle, Josiah White, of the Lehigh Coal and Navigation Company, the successful application of the hot- blast there. At this time, 1837-38, the Lehigh Coal & Navigation Company, and other companies whose splendid mines cluster in the neighborhood of Mauch Chunk, Pa., were experimenting in the use of anthracite in the blast-furnace, but with such small success that it was determined to send Mr. Erskine Hazard, one of the leading spirits of the company, and afterwards the leading spirit of the Lehigh Crane Iron Company, over to Wales, to investigate, the practice at Yniscedwin and engage a competent person to come to this country to superintend the erection of furnaces on the Lehigh. Mr. Hazard arrived in November 1838 and found the furnace in full and successful operation. In the United States, where the Lehigh Coal & Navigation Company (LC&N) had begun shipping anthracite to Philadelphia in 1820 because the principles could not obtain sufficient fuels for their iron works at the 'Falls of the Schuylkill' —so had built the Lehigh Canal and taken over the works of the haphazard Lehigh Coal Mine Company—by the late 1820s having established works that were running smoothly, after building America's second operating railroad in 1827, they'd great interest in exploiting the great anthracite deposits of Schuylkill County for ironmaking, which mills foundries were their principle businesses. The Franklin Institute, in 1830, offered a gold medal to the manufacturer of the greatest quantity of anthracite iron, and Nicholas Biddle and his associates offered a prize of $5,000 to the first individual to smelt a certain quantity of iron ore within a given time, using anthracite. The Lehigh Coal & Navigation, by then an industrial giant of the times, also offered free water power and discount rates on coal and shipping to encourage the development of the process. 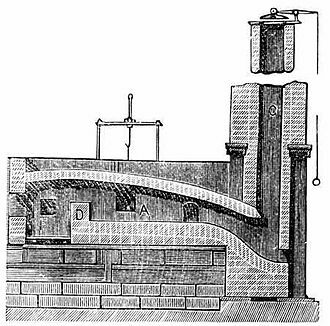 The first key breakthrough occurred in 1828-29, when Scotsman James Beaumont Neilson patented the hot blast technique & process, which he had conceived in an attempt to improve the efficiency of conventionally fueled furnaces. The first person to employ the hot blast technique to anthracite smelting was Dr. Frederick W. Gesenhainer, who filed for a patent on the process in 1831 and received it in 1833. In 1836, he tried smelting anthracite iron on a practical scale at his property, Valley Furnace, near Pottsville, Pennsylvania, while in the same year White & Hazard's LC&N Co. built two experimental blast furnaces in Mauch Chunk. He produced a small quantity of iron, but due to mechanical breakdowns, could not keep the furnace in operation for more than two months. While distinguished visitors, including Governor Joseph Ritner, acknowledged his success, he sold out his share in Valley Furnace and went to New York City. The research was proceeding along parallel lines across the Atlantic. George Crane, owner, and David Thomas, superintendent of the Yniscedwyn Iron Works, had themselves[b] conceived of the idea of using hot blast to smelt anthracite. Thomas was sent to Scotland to examine Neilson's installation and reproduced it at Yniscedwyn. Crane filed for a British patent on smelting iron with anthracite and hot blast in 1836 and received it in 1837. By the time the patent was sealed, Yniscedwyn was producing about 35 tons of iron using anthracite only as a fuel. Inspired both by Geisenhainer and Crane (whose success was closely followed by the LC&N), experiments in the US continued. Baughman, Guiteau and Company used an old furnace near Mauch Chunk to produce some anthracite iron during late 1837. They built another experimental furnace nearby, which was worked for about two months during fall and winter 1838 and for some time in 1839, but mechanical deficiencies led them to abandon the furnace at the end of 1839. In the meantime, Pioneer Furnace, in Pottsville, was blown in using anthracite fuel in 1839. It was built by William Lyman obtained the aid of a Welsh emigrant, Benjamin Perry, who was familiar with Neilson's process and the Yniscedwyn works, for the blowing-in. The furnace ran for three months on anthracite alone and fulfilled the conditions to win the $5,000 prize. In the design of Pioneer Furnace, Lyman had also been assisted by David Thomas, who had arrived in the United States in May 1839. Thomas was engaged by the LC&N to set up the Lehigh Crane Iron Company and its first furnace at Catasauqua, which went into blast in 1840, along with five other anthracite furnaces. This marked the commercial establishment of anthracite iron production in the United States. The opening of bituminous coal deposits suitable for coking in the western part of the Allegheny Plateau resulted in the gradual displacement of anthracite as a fuel. The production of coke-fired furnaces overtook that of anthracite-fired furnaces in 1875, and the last anthracite furnaces in the US, the former Lock Ridge Iron Company, converted to coke in 1914. ^ Superintendent of the Yniscedwyn Iron Works, David Thomas had operated the works for over twenty-two years when Crane bought the Iron Works, and had been experimenting with Anthracite mixes for many years. ^ Josephine Reed Garzelloni; Carole Lyn Carr; R. Steffey, eds. (1998) . History of Schuylkill County: with Illustrations and Biographical Sketches of Some of Its Prominent Men and Pioneers (PDF). New York: W. W. Munsell & Co. Retrieved 5 September 2016. ^ Bartholomew, Ann M.; Metz, Lance E.; Kneis, Michael (1989). DELAWARE and LEHIGH CANALS, 158 pages (First ed.). Oak Printing Company, Bethlehem, Pennsylvania: Center for Canal History and Technology, Hugh Moore Historical Park and Museum, Inc., Easton, Pennsylvania. pp. 4–5. ISBN 0930973097. LCCN 89-25150. Bartholomew, Ann M.; Metz, Lance E.; Kneis, Michael (1989). Delaware and Lehigh Canals (First ed.). Bethlehem, Pennsylvania: Oak Printing Company. pp. 4–5. ISBN 0930973097. LCCN 89-25150 – via Center for Canal History and Technology, Hugh Moore Historical Park and Museum, Inc., Easton, Pennsylvania. Bartholomew, Craig L.; Metz, Lance E. (1988). Bartholomew, Ann, ed. The Anthracite Industry of the Lehigh Valley. Center for Canal History and Technology. ISBN 0-930973-08-9. Korson, George (1960). Black Rock: Mining Folklore of the Pennsylvania Dutch. Baltimore: The Johns Hopkins Press. Gordon, Robert B. (1996). American Iron 1607–1900. Baltimore: The Johns Hopkins University Press. ISBN 0-8018-6816-5. Allentown is a city located in Lehigh County, United States. It is Pennsylvanias third most populous city and the 224th largest city in the United States, as of the 2010 census, the city had a total population of 118,032 and is currently the fastest growing city in all of Pennsylvania. It is the largest city in the area known as the Lehigh Valley. Allentown constitutes a portion of the New York City Metropolitan Area and is the county seat of Lehigh County, in 2012, the city celebrated the 250th anniversary of its founding in 1762. Located on the Lehigh River, Allentown is the largest of three adjacent cities, in Northampton and Lehigh counties, that make up a region of eastern Pennsylvania known as the Lehigh Valley, the Norfolk Southern Railways Lehigh Line, runs through Allentown heading east across the Delaware River. The Norfolk Southern Railways Reading Line runs through Allentown heading west to Reading, the price for this tract included shoes and buckles, shirts, scissors, needles, looking glasses and pipes. The land was surveyed on November 23,1736. Used primarily as a hunting and fishing lodge, here Allen entertained prominent guests including his brother-in-law, James Hamilton and it is likely that a certain amount of rivalry with the Penns prompted Judge Allen to decide to start a town of his own in 1762. Ten years before, in 1752, Northampton and Berks counties had been formed, each with a county seat and Reading, respectively. It is recorded that, in 1763, the year after the founding of Allentown. To this effort William Allen lent all his influence as Chief Justice, the influence of the Penns, however and Easton was retained as the county seat of all that vast area which the notorious Walking Purchase had opened up. The town was located between present-day Fourth and Tenth Streets, and Union and Liberty Streets, many streets on the original plan were named for Allens children, William, James and John. Allen Street was named for Allen himself, and was the main thoroughfare, Hamilton Street was named for James Hamilton. Wrought iron is an iron alloy with a very low carbon content in contrast to cast iron. It is a mass of iron with fibrous slag inclusions which gives it a grain resembling wood. Wrought iron is tough, ductile, corrosion-resistant and easily welded, before the development of effective methods of steelmaking and the availability of large quantities of steel, wrought iron was the most common form of malleable iron. 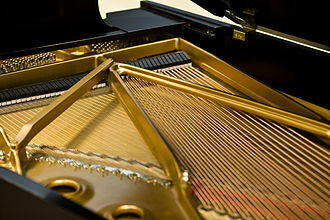 A wrought product is one that has been worked by forging, rolling, etcetera, to change its form. Wrought iron is a worked iron product that is seldom produced today as other cheaper. Historically, a modest amount of iron was refined into steel. The demand for wrought iron reached its peak in the 1860s with the adaptation of ironclad warships, however, as properties such as brittleness of mild steel improved, it became less costly and more widely available than wrought iron, whose usage declined. Wrought iron is no longer produced on a commercial scale, many products described as wrought iron, such as guard rails, garden furniture and gates, are actually made of mild steel. They retain that description because they are made to resemble objects which in the past were wrought by hand by a blacksmith, the word wrought is an archaic past participle of the verb to work, and so wrought iron literally means worked iron. Wrought iron is a term for the commodity, but is used more specifically for finished iron goods. It was used in that sense in British Customs records. Cast iron, unlike wrought iron, is brittle and cannot be worked either hot or cold, Cast iron can break if struck with a hammer. In the 17th, 18th, and 19th centuries, wrought iron went by a variety of terms according to its form, origin. While the bloomery process produced wrought iron directly from ore, cast iron or pig iron were the materials used in the finery forge. Pig iron and cast iron have higher content than wrought iron. Cast and especially pig iron have excess slag which must be at least partially removed to produce quality wrought iron, at foundries it was common to blend scrap wrought iron with cast iron to improve the physical properties of castings. Northampton County is a county located in the U. S. state of Pennsylvania. As of the 2010 census, the population was 297,735, the county was formed in 1752 from parts of Bucks County. Its namesake was Northamptonshire and the county seat of Easton is named for the country house Easton Neston, Northampton County is included in the Allentown-Bethlehem-Easton, PA-NJ Metropolitan Statistical Area, which is included in the New York-Newark, NY-NJ-CT-PA Combined Statistical Area. 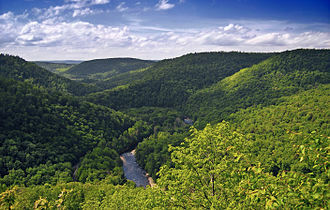 Its northern edge borders The Poconos, and its eastern section borders the Delaware River, the county is industrially-oriented, producing anthracite coal and other industrial products. Bethlehem Steel, once one of the worlds largest manufacturers of steel, was located prior to its closing in 2003. 10. 5% of the population were of Hispanic or Latino ancestry, as of the census of 2000, there were 267,066 people,101,541 households, and 71,078 families residing in the county. The population density was 714 people per square mile, there were 106,710 housing units at an average density of 286 per square mile. The racial makeup of the county was 91. 23% White,2. 77% Black or African American,0. 15% Native American,1. 37% Asian,0. 03% Pacific Islander,3. 06% from other races, and 1. 39% from two or more races. 6. 69% of the population were Hispanic or Latino of any race,24. 0% were of German,14. 0% Italian,8. 8% Irish,5. 1% English and 5. 1% American ancestry according to Census 2000. 89. 3% spoke English and 5. 5% Spanish as their first language,24. 70% of all households were made up of individuals and 11. 20% had someone living alone who was 65 years of age or older. The average household size was 2.53 and the family size was 3.02. In the county, the population was out with 23. 30% under the age of 18,9. 20% from 18 to 24,28. 30% from 25 to 44,23. 40% from 45 to 64. The median age was 38 years, for every 100 females there were 94.80 males. For every 100 females age 18 and over, there were 91.70 males, Northampton is one of the six counties in Pennsylvania which has adopted a home rule charter. Instead of being run by a Board of Commissioners and several Row Officers, voters elect an Executive, a nine-person Council, a Controller, the Executive and District Attorney are elected by all voters in the County, as are five members of the Council. Hot blast refers to the preheating of air blown into a blast furnace or other metallurgical process. As this considerably reduced the fuel consumed, hot blast was one of the most important technologies developed during the Industrial Revolution, hot blast allowed higher furnace temperatures, which increased the capacity of furnaces. As first developed, it worked by alternately storing heat from the flue gas in a firebrick-lined vessel with multiple chambers. This is known as regenerative heating, hot blast was invented and patented for iron furnaces by James Beaumont Neilson in 1828 at Wilsontown Ironworks in Scotland, but was applied in other contexts, including late bloomeries. Later the carbon monoxide in the gas was burned to provide additional heat. James Beaumont Neilson, previously foreman at Glasgow gas works, invented the system of preheating the blast for a furnace and he, with partners including Charles Macintosh, patented this in 1828. Initially the heating vessel was made of iron plates, but these oxidized. On the basis of a January 1828 patent, Thomas Botfield has a claim as the inventor of the hot blast method. Neilson is credited as inventor of hot blast because he won patent litigation and his partners engaged in substantial litigation to enforce the patent against infringers. The spread of technology across Britain was relatively slow. By 1840,58 ironmasters had taken out licenses, yielding a royalty income of £30,000 per year, by the time the patent expired there were 80 licenses. In 1843, just after it expired,42 of the 80 furnaces in south Staffordshire were using hot blast, other advantages of hot blast were that raw coal could be used instead of coke. In Scotland, the poor black band ironstone could be profitably smelted. It increased the output of furnaces. In the case of Calder ironworks from 5.6 tons per day in 1828 to 8.2 in 1833, early hot blast stoves were troublesome, as thermal expansion and contraction could cause breakage of pipes. 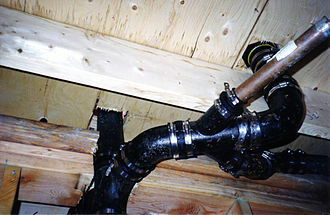 This was somewhat remedied by supporting the pipes on rollers and it was necessary to devise new methods of connecting the blast pipes to the tuyeres, as leather could not longer be used. Pennsylvania /ˌpɛnsᵻlˈveɪnjə/, officially the Commonwealth of Pennsylvania, is a state located in the northeastern and Mid-Atlantic regions of the United States. The Appalachian Mountains run through its middle, Pennsylvania is the 33rd largest, the 5th most populous, and the 9th most densely populated of the 50 United States. The states five most populous cities are Philadelphia, Allentown, the state capital, and its ninth-largest city, is Harrisburg. Pennsylvania has 140 miles of shoreline along Lake Erie and the Delaware Estuary. The state is one of the 13 original founding states of the United States, it came into being in 1681 as a result of a land grant to William Penn. Part of Pennsylvania, together with the present State of Delaware, had earlier been organized as the Colony of New Sweden and it was the second state to ratify the United States Constitution, on December 12,1787. Independence Hall, where the United States Declaration of Independence and United States Constitution were drafted, is located in the states largest city of Philadelphia, during the American Civil War, the Battle of Gettysburg, was fought in the south central region of the state. Valley Forge near Philadelphia was General Washingtons headquarters during the winter of 1777–78. Pennsylvania is 170 miles north to south and 283 miles east to west, of a total 46,055 square miles,44,817 square miles are land,490 square miles are inland waters, and 749 square miles are waters in Lake Erie. It is the 33rd largest state in the United States, Pennsylvania has 51 miles of coastline along Lake Erie and 57 miles of shoreline along the Delaware Estuary. Cities include Philadelphia, Reading and Lancaster in the southeast, Pittsburgh in the southwest, the tri-cities of Allentown, the northeast includes the former anthracite coal mining communities of Scranton, Wilkes-Barre, Pittston City, and Hazleton. Erie is located in the northwest, the state has 5 regions, namely the Allegheny Plateau and Valley, Atlantic Coastal Plain and the Erie Plain. Straddling two major zones, the majority of the state, with the exception of the corner, has a humid continental climate. The largest city, has characteristics of the humid subtropical climate that covers much of Delaware. Charcoal is a lightweight, black residue, consisting of carbon and any remaining ash, obtained by removing water and other volatile constituents from animal and vegetation substances. Charcoal is usually produced by slow pyrolysis- the heating of wood or other substances in the absence of oxygen, the whole pile is covered with turf or moistened clay. The firing is begun at the bottom of the flue, the success of the operation depends upon the rate of the combustion. The operation is so delicate that it was left to colliers. They often lived alone in small huts in order to tend their wood piles, for example, in the Harz Mountains of Germany, charcoal burners lived in conical huts called Köten which are still much in evidence today. 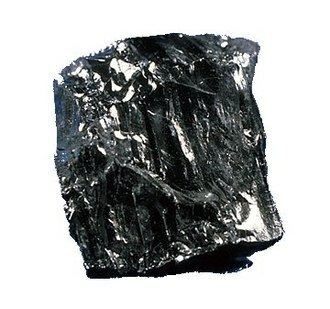 The massive production of charcoal was a cause of deforestation. The increasing scarcity of easily harvested wood was a factor behind the switch to fossil fuel equivalents, mainly coal. Charcoal made at 300 °C is brown and friable, and readily inflames at 380 °C, made at higher temperatures it is hard and brittle, in Finland and Scandinavia, the charcoal was considered the by-product of wood tar production. The best tar came from pine, thus pinewoods were cut down for tar pyrolysis, the residual charcoal was widely used as substitute for metallurgical coke in blast furnaces for smelting. 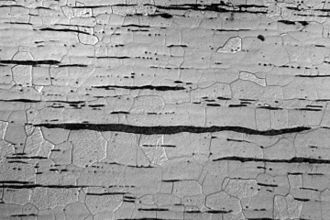 Tar production led to deforestation, it has been estimated all Finnish forests are younger than 300 years. The end of tar production at the end of the 19th century resulted in rapid re-forestation, the charcoal briquette was first invented and patented by Ellsworth B. A. Zwoyer of Pennsylvania in 1897 and was produced by the Zwoyer Fuel Company. The process was popularized by Henry Ford, who used wood. Ford Charcoal went on to become the Kingsford Company, Charcoal has been made by various methods. The traditional method in Britain used a clamp and this is essentially a pile of wooden logs leaning against a chimney. The chimney consists of 4 wooden stakes held up by some rope, the logs are completely covered with soil and straw allowing no air to enter. It must be lit by introducing some burning fuel into the chimney, if the soil covering gets torn by the fire, additional soil is placed on the cracks. Jim Thorpe is a borough and the county seat of Carbon County in the U. S. state of Pennsylvania. The population was 4,781 at the 2010 census, the town has been called the Switzerland of America due to the picturesque scenery, mountainous location, and architecture, as well as the Gateway to the Poconos. 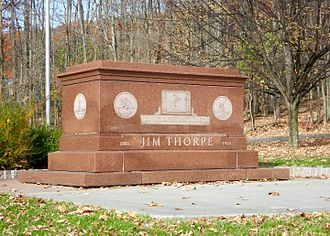 It is in eastern Pennsylvania about 80 miles north of Philadelphia and 100 miles west of New York City and this town is historically known for burying the body of Native American sports legend Jim Thorpe. The company town was founded by Josiah White and his two partners, founders of the Lehigh Coal & Navigation Company. It would thereby connect LC&Ns coal mines to Philadelphia, New York City, and other cities in New Jersey and Delaware. The town grew slowly in its first decade, became larger as a railroad. Mauch Chunk is on a flat at the mouth of a right tributary of the Lehigh River at the foot of Mount Pisgah. This placed Mauch Chunk in the center of a nexus of transportation in country tough to travel through, the LC&N headquarters was built across the street from the stylish passenger station that was soon boarding passengers onto trains from New York and Philadelphia to Buffalo. Mauch Chunk was the location of one of the trials of the Molly Maguires in 1876, the population of the borough in 1900 was 4,020, in 1910, it was 3,952. When she heard that the boroughs of Mauch Chunk and East Mauch Chunk were desperately seeking to attract business, according to Jim Thorpes son, Patricia was motivated by money in seeking the deal. The monument site contains his tomb, two statues of him in athletic poses, and historical markers describing his life story, the grave rests on mounds of soil from Thorpes native Oklahoma and from the Stockholm Olympic Stadium in which he won his Olympic medals. Before Jack Thorpe could respond to the ruling he died at the age of 73 on February 22,2011, because of his death his representatives were given more time to respond to the ruling. On May 2,2011, William and Richard Thorpe, Jim Thorpes remaining sons, on April 19,2013, Federal Judge Richard Caputo ruled in favor of William and Richard Thorpe, ruling that the borough amounts to a museum under the law. Iron ores are rocks and minerals from which metallic iron can be economically extracted. The ores are rich in iron oxides and vary in color from dark grey, bright yellow. The iron itself is found in the form of magnetite, goethite, limonite or siderite. Ores containing very high quantities of hematite or magnetite are known as ore or direct shipping ore. Iron ore is the raw material used to make pig iron, indeed, it has been argued that iron ore is more integral to the global economy than any other commodity, except perhaps oil. Metallic iron is virtually unknown on the surface of the Earth except as iron-nickel alloys from meteorites, although iron is the fourth most abundant element in the Earths crust, comprising about 5%, the vast majority is bound in silicate or more rarely carbonate minerals. Prior to the revolution, most iron was obtained from widely available goethite or bog ore, for example during the American Revolution. Prehistoric societies used laterite as a source of iron ore, much of the iron ore utilized by industrialized societies has been mined from predominantly hematite deposits with grades of around 70% Fe. These deposits are referred to as direct shipping ores or natural ores. Iron-ore mining methods vary by the type of ore being mined, there are four main types of iron-ore deposits worked currently, depending on the mineralogy and geology of the ore deposits. These are magnetite, massive hematite and pisolitic ironstone deposits, banded iron formations are sedimentary rocks containing more than 15% iron composed predominantly of thinly bedded iron minerals and silica. Banded iron formations occur exclusively in Precambrian rocks, and are weakly to intensely metamorphosed. Banded iron formations may contain iron in carbonates or silicates, banded iron formations are known as taconite within North America. The mining involves moving tremendous amounts of ore and waste, the waste comes in two forms, non-ore bedrock in the mine, and unwanted minerals which are an intrinsic part of the ore rock itself. The mullock is mined and piled in dumps, and the gangue is separated during the beneficiation process and is removed as tailings. A foundry is a factory that produces metal castings. Metals are cast into shapes by melting them into a liquid, pouring the metal in a mold, the most common metals processed are aluminium and cast iron. However, other metals, such as bronze, steel, magnesium, in this process, parts of desired shapes and sizes can be formed. In metalworking, casting involves pouring liquid metal into a mold, which contains a hollow cavity of the desired shape, the solidified part is known as a casting, which is ejected or broken out of the mold to complete the process. 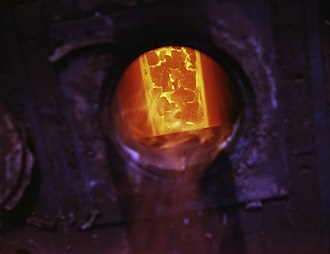 Casting is most often used for making complex shapes that would be difficult or uneconomical to make by other methods, melting is performed in a furnace. Virgin material, external scrap, internal scrap, and alloying elements are used to charge the furnace, virgin material refers to commercially pure forms of the primary metal used to form a particular alloy. Alloying elements are either forms of an alloying element, like electrolytic nickel, or alloys of limited composition. External scrap is material from other forming processes such as punching, internal scrap consists of gates, defective castings, and other extraneous metal oddments produced within the facility. The process includes melting the charge, refining the melt, adjusting the melt chemistry, refining is done to remove deleterious gases and elements from the molten metal to avoid casting defects. Material is added during the process to bring the final chemistry within a specific range specified by industry and/or internal standards. Certain fluxes may be used to separate the metal from slag and/or dross, during the tap, final chemistry adjustments are made. 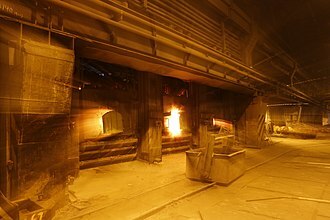 Several specialised furnaces are used to heat the metal, furnaces are refractory-lined vessels that contain the material to be melted and provide the energy to melt it. Modern furnace types include electric arc furnaces, induction furnaces, reverberatory, furnace choice is dependent on the alloy system quantities produced. 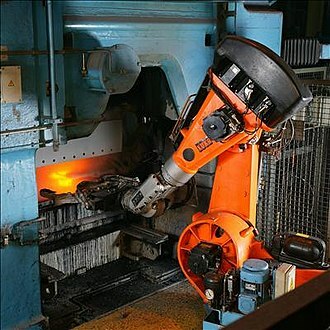 For ferrous materials EAFs, and induction furnaces are commonly used and crucible furnaces are common for producing aluminium and brass castings. An energy crisis is any significant bottleneck in the supply of energy resources to an economy. In popular literature, it refers to one of the energy sources used at a certain time and place. Industrial development and population growth have led to a surge in the demand for energy in recent years. Government actions like tax hikes, nationalisation of energy companies, and regulation of the sector, shift supply. Market failure is possible when monopoly manipulation of markets occurs, a crisis can develop due to industrial actions like union organized strikes and government embargoes. The cause may be over-consumption, aging infrastructure, choke point disruption or bottlenecks at oil refineries, an emergency may emerge during very cold winters due to increased consumption of energy. Large fluctuations and manipulations in future derivatives can have a impact on price. Large investment banks control 80% of oil derivatives as of May 2012 and this increase contributed to an improvement of global energy output from 117687 TWh in 2000 to 143 851TWh in 2008. Limitations on free trade for derivatives could reverse this trend of growth in energy production, kuwaiti Oil Minister Hani Hussein stated that Under the supply and demand theory, oil prices today are not justified, in an interview with Upstream. Pipeline failures and other accidents may cause minor interruptions to energy supplies, a crisis could possibly emerge after infrastructure damage from severe weather. Attacks by terrorists or militia on important infrastructure are a problem for energy consumers. Political events, for example, when governments change due to change, monarchy collapse, military occupation. Fuel shortage can be due to the excess and useless use of the fuels, North American natural gas crisis 2000-20082004 Argentine energy crisis North Korea has had energy shortages for many years. Zimbabwe has experienced a shortage of supplies for many years due to financial mismanagement. Political riots occurring during the 2007 Burmese anti-government protests were sparked by rising energy prices,2008 Central Asia energy crisis, caused by abnormally cold temperatures and low water levels in an area dependent on hydroelectric power. A blast furnace is a type of metallurgical furnace used for smelting to produce industrial metals, generally iron, but others such as lead or copper. The end products are usually molten metal and slag phases tapped from the bottom, the downward flow of the ore and flux in contact with an upflow of hot, carbon monoxide-rich combustion gases is a countercurrent exchange and chemical reaction process. In contrast, air furnaces are naturally aspirated, usually by the convection of hot gases in a chimney flue, according to this broad definition, bloomeries for iron, blowing houses for tin, and smelt mills for lead would be classified as blast furnaces. Blast furnaces existed in China from about 1st century AD and in the West from the High Middle Ages and they spread from the region around Namur in Wallonia in the late 15th century, being introduced to England in 1491. The fuel used in these was invariably charcoal, the successful substitution of coke for charcoal is widely attributed to Abraham Darby in 1709. The efficiency of the process was enhanced by the practice of preheating the combustion air. The oldest extant blast furnaces were built during the Han Dynasty of China in the 1st century AD. However, cast iron tools and weapons were widespread in China by the 5th century BC. These early furnaces had clay walls and used phosphorus-containing minerals as a flux, the effectiveness of the Chinese blast furnace was enhanced during this period by the engineer Du Shi, who applied the power of waterwheels to piston-bellows in forging cast iron. He suggests that early blast furnace and cast iron production evolved from furnaces used to melt bronze, though, iron was essential to military success by the time the State of Qin had unified China. Usage of the blast and cupola furnace remained widespread during the Song and Tang Dynasties and this may have happened as early as the 4th century AD. The Chinese blast furnace remained in use well until the 20th century, the backyard furnaces favoured by Mao Zedong during the Great Leap Forward were of this type. Pig iron is an intermediate product of the iron industry. Pig iron is made by smelting iron ore into an ingot of impure high carbon-content iron in a blast furnace as an ingredient for further processing steps. When the metal had cooled and hardened, the ingots were simply broken from the runner. As pig iron is intended for remelting, the size of the ingots. Smelting and producing pig iron and other products was known to the Ancient Egyptians. The Roman Empire and the Muslim caliphates of the Middle Ages inherited and refined these technologies, because of the collapse of the Western Roman Empire, Western Europe did not rediscover the process until the Late Middle Ages. The phase transition of the iron into liquid in the furnace was an avoided phenomenon, the Chinese were making pig iron by the Zhou Dynasty. Traditionally pig iron was worked into wrought iron in forges, puddling furnaces. In these processes, pig iron is melted and a current of air is directed over it while it is stirred or agitated. Former blast furnace in Port of Sagunto, Valencia, Spain. Chinese fining and blast furnace, Tiangong Kaiwu, 1637. Trout Hall, built in 1770 by James Allen (son of Allentown founder William Allen), is the oldest house in Allentown. From 1867 to 1905, it served as the home of Muhlenberg College. 1926 tablet placed by the Daughters of the American Revolution at the Old Allentown Cemetery, Tenth and Linden Street, honoring American Revolutionary War patriots from Allentown. The Old Allentown Cemetery, just behind this monument, has the graves of many of the patriots whose names are inscribed on the memorial. Saeger's Mill was built in 1828 along the Lehigh Canal in the same year it was opened. It used water power purchased from the Lehigh Canal and Navigation Company, the owners of the canal. The mill straddled the canal, and a covered bridge allowed the company to use both banks of the canal. Sager's Mill was destroyed by a fire in 1951. PPL Center construction in downtown Allentown in 2013. President's House (Philadelphia). The Masters-Penn mansion housed Pennsylvania's governor in the early 1770s. It later served as the presidential mansion of George Washington and John Adams, 1790–1800, while Philadelphia was the temporary national capital. A Siemens-Martin steel oven from the Brandenburg Museum of Industry. From Fra Burmeister og Wain's Iron Foundry, by Peder Severin Krøyer, 1885. A Foundryman, pictured by Daniel A. Wehrschmidt in 1899. A political caricature depicting American demands for respect, and seaman's rights from the British. Loyalists landing in New Brunswick. Loyalists settlers to the Canadas were Revolution-era exiles, hostile to union with the U.S., whereas newer immigrants to the Canadas were neutral, or supportive of the British. 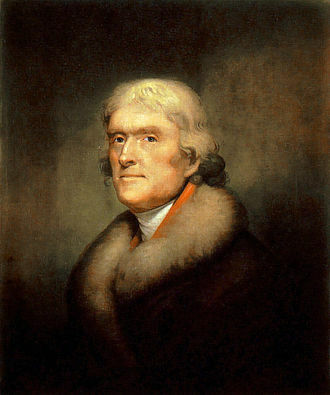 Thomas Jefferson, the third President of the United States (1801–1809) believed that the acquisition of the Canadas was a "mere matter of marching". 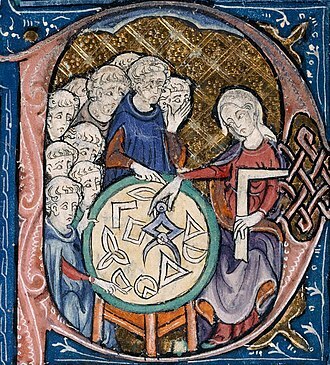 A European and an Arab practicing geometry in the 15th century. Visual checking of the Pythagorean theorem for the (3, 4, 5) triangle as in the Zhoubi Suanjing 500–200 BC. The Pythagorean theorem is a consequence of the Euclidean metric. Illustration of coal mining and coke burning from 1879. Coal coking ovens at Cokedale, west of Trinidad, Colorado, supplied steel mills in Pueblo, Colorado. A Roberts loom in a weaving shed in 1835. Textiles were the leading industry of the Industrial Revolution, and mechanized factories, powered by a central water wheel or steam engine, were the new workplace. 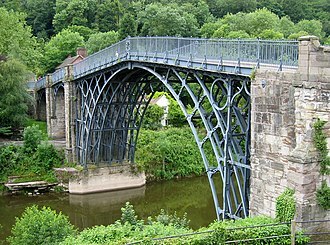 The Iron Bridge, Shropshire, England, the world's first bridge constructed of iron opened in 1781. 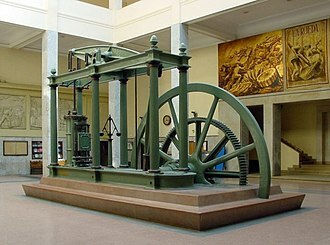 A Watt steam engine. James Watt transformed the steam engine from a reciprocating motion that was used for pumping to a rotating motion suited to industrial applications. Watt and others significantly improved the efficiency of the steam engine. 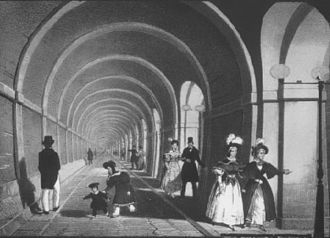 The Thames Tunnel (opened 1843). Cement was used in the world's first underwater tunnel. An abandoned charcoal kiln near Walker, Arizona, USA. 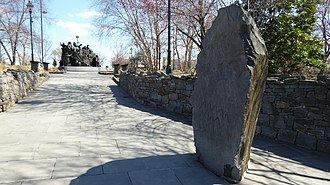 "Leacht Quimhneachain Na Gael", an Irish famine memorial at Penn's Landing honors the large Irish community (14.2% of the city's population). 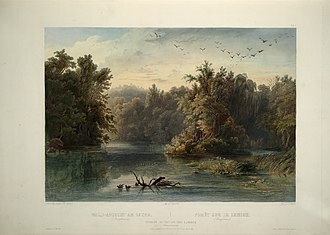 Forest scene on the Lehigh (Pennsylvania) (circa 1832): aquatint by Karl Bodmer from "Maximilian, Prince of Wied’s Travels in the Interior of North America, during the years 1832–1834"
The gasoline shortages of World War II brought about the resurgence of horse-and-wagon delivery. Blast furnace (left), and three Cowper stoves (right) used to preheat the air blown into the furnace. Hot blast furnace: note the flow of air from the stove in the background to the two blast furnaces, and hot air from the foreground furnace being drawn off to heat the stove. The Partners - together the two men, ten years older Joshiah White, and young Erskine Hazard would found a succession of innovative companies that enabled the Industrial Revolution in America. W. Broad St., Tamaqua. July 2013. Section of a 17th and 18th century blast furnace. The bellows, at right, draw in air directly from the atmosphere.